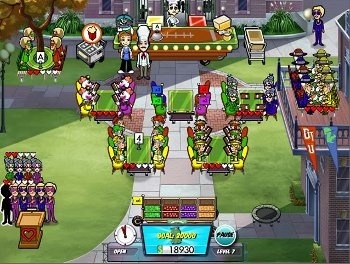 Time management gameplay is what the Diner Dash series is known for, and Diner Dash 5: BOOM! makes few changes to this simple yet addictive click-fest equation. If you haven't played the series before, the main objective is to seat customers, serve them delicious food and deliver the check as quickly as possible. Take too long to deliver the food, and customers will become increasingly irritated, sometimes even skipping out on the check and costing you precious points. While you're busy juggling tables, trays and customers, you also want to try and complete similar actions in succession to earn bonus points. Bonus points are used to unlock certain upgrades, which you'll need to finish the later levels. As promised, Diner Dash 5:BOOM! begins with a bang. When someone erases the word "fat" from Flo's "Fat-Free Breakfast" sign, her diner literally swells and bursts from the gluttonous rush of hungry customers. Enter Mr. Big: a corrupt, mustachioed tycoon with a gaggle of jargon-spouting lawyers claiming that Flo must rebuild her diner, pronto, otherwise Mr. Big would be well within his rights to purchase the land. Undaunted by sinister-looking moustaches, Flo takes her diner to the streets; assembling makeshift tables and serving customers smack dab in the middle of abandoned intersections, parking lots and campuses. As she travels through Diner Town, her construction savvy customer, Hal, faithfully rebuilds her diner back at Avenue Flo, which you get to play in during the last levels of the game. As one may imagine, serving food from a makeshift diner in the middle of the street comes with some environmental hazards. When it rains or gets too windy, Flo will need to visit each table and wind up the umbrellas or tie down the tablecloths. Occasionally, a nearby circuit box or fire hydrant will break and Flo will need to track down a handyman to repair it, pronto. These distractions provide a welcomed break from the focus on dealing with the customers. Also, after a few minutes of the same customers ordering Flo around and seething at the wait, it's fun to see their reaction to getting a face full of fire hydrant water. Along with natural disasters, there are also hazards of the customer persuasion. There's just enough variety to keep the relatively straightforward task of seating customers interesting. Not only must you match them with the appropriately-hued tables, but you also have to pay attention to the type of customer they are. Certain customers should only be seated next to each other at your own peril, or if you just feel like raising the difficulty of a level. Every type of customer come with their own caveats: lawyers shouldn't be seated next to other lawyers, otherwise they'll argue and disrupt the other customers; librarians prefer the quiet and will actively shush other diners speaking in anything louder than a whisper; and tourists will occasionally want Flo to come by and take a picture of them. Diner Dash 5 also includes the addition of Townies, folks that mill about the diner's general vicinity in the hopes of leeching onto a group's dinner plans. Townies spice up the gameplay in an infuriating yet compelling way. They're reason to pay extra attention to the group you're seating - if you seat a group with an empty slot that could be filled by a Townie, that's potential extra points you're losing out on. After earning an Expert score in a difficult scenario, you'll likely want to take advantage of the new Facebook integration, where you can publish braggadocios posts about your achievements and high scores, as well as send sneakers as an in-game speed boost to Facebook friends. Though I can understand the attraction of a Facebook component, especially for a casual game, it did feel a bit tacked on. Unlike most games featured on Facebook, it can't be played in a browser, and you must own the game to even use the super speedy sneakers your friends give you. Facebook integration works well when it's complemented with a collection task or a task where friends can help out. But when Diner Dash is essentially a single-player game, it seems odd to add Facebook, which typically only works well with "multi-player" games. Diner Dash doesn't try to reinvent itself with each sequel, which is both reassuring and bothersome. Though there are plenty of new elements in Diner Dash 5, it still fell under the "if you've played one, you've played them all" umbrella. If you're looking for an entirely new experience in the Diner Dash series, play Avenue Flo. If you're looking for the typical Diner Dash game with a few awesome tweaks, Diner Dash 5 is still worth getting your hands on. Bottom Line: Diner Dash 5 is a refreshing addition to the series, introducing just enough novelties to give it a fresh spin while still retaining the quality and addictiveness of the original series. Recommendation: Diner Dash 5 is available as a free trial over at Playfirst, and it's certainly worth an hour of your time to check it out.